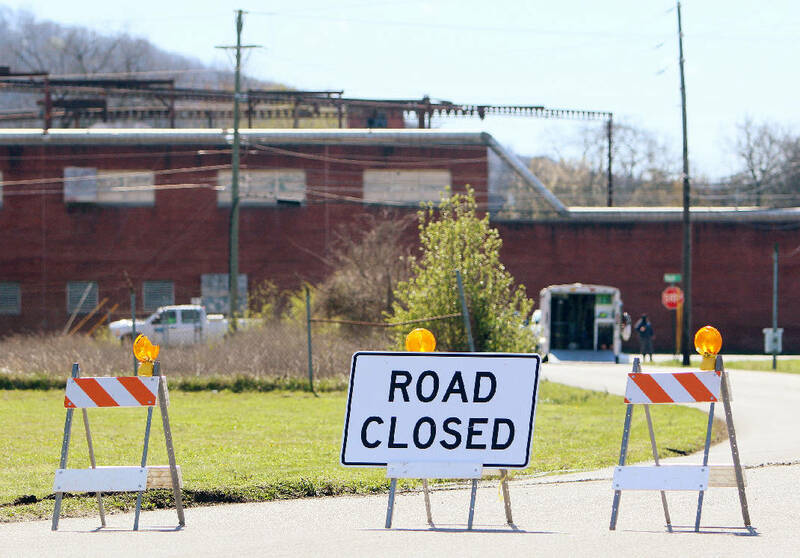 Signs block Williams Street in front of the abandoned Coats American building Monday, March 12, 2018 in Rossville, Ga., where an oil spill with Polychlorinated biphenyls was discovered. Police suspect copper thieves caused the spill. ROCK SPRING, Ga. — As workers continue to clean up a potentially toxic oil spill, the Walker County Development Authority indefinitely postponed the sale of the Coats American plant in Rossville. The authority began seeking offers for the site in January, but it voted Tuesday to revisit a sale once the Environmental Protection Agency lets people work there again. According to Rossville police, a man tipped over a transformer inside the abandoned plant on March 11, spilling oil into a storm drain. Investigators believe the man tried to strip the copper off the transformer. The oil contained polychlorinated biphenyls, a chemical linked to cancer, reproductive issues among men and development issues among children. The oil ran from the storm drain to the Williams Street Tributary. The night of the spill, a man told police he saw an oily sheen in a drainage ditch across the street from the plant. The authority planned to review proposals for the site at its March 13 meeting. But after the spill, Walker County Economic and Community Development Director Robert Wardlaw suggested the board postpone any action, as a team responded to the spill. The authority agreed. Now, a month has passed and a team still needs to work through the spill. Commissioner Shannon Whitfield said the county contracted with Marion Environmental, whose workers are reviewing the site, located at 105 Maple St. in Rossville. The team is looking at how much PCB is in the area. The county will then submit a proposed cleanup plan to the EPA. He said the threshold for PCB in the water is about 50 parts per million. Anything above that could be dangerous. But the initial tests, he said, showed the chemical at a level lower than that. Wardlaw told the authority he wants potential buyers to know the full extent of an environmental purchase. "That's the right thing for us to do," he said. "I don't want any chance whatsoever of information that's incomplete when these guys made decisions in good faith before this event happened." Whitfield added: "We're going to make sure that we're fully disclosed with any potential buyer of that property and we give them a clean bill of health." Before the spill, Wardlaw said the authority received offers from Catoosa County Chairman Steve Henry and S&H Trucking. Henry, a developer, did not return a call seeking comment Tuesday. But his offer is at least his second planned investment in downtown Rossville. In June, Henry bought the old Peerless Woolen Mill building for $125,000. That building is 1.1 million square feet and sits on 27 acres. Located across the street, the Coats American plant is about 350,000 square feet and sits on eight acres. Henry and his partners have not announced their intentions with the Peerless mill. He said they want to create a master plan, though their aims are impacted depending on whether they own the Coats American site. "We've got the biggest investment there with Peerless," he said. "Anything we do there, it kind of affects us. We're trying to create some jobs, hopefully." S&H Trucking, meanwhile, also has a building across Maple Street from the Coats American plant. Miguel Partap, a corporate controller for S&H, said the company has existed for 21 years and hauls goods across the country. He declined to discuss the company's proposal for the site.